Prevent Piano Teacher Injury before it's too late! Who knew that teaching music could be dangerous to your health? We don't want to learn that the hard way, when we can prevent piano teacher injury using 3 healthy tips. As I write this blog (March, 2014), I am waiting to have surgery to reattach and repair the ligament on my right shoulder. Yes, I am the victim of a Teaching Injury. How did I do this? I’ve been teaching for over 35 years. During that time, I would stretch and point to the music on the piano. The ligaments on my right shoulder started to fray and eventually tear. Prevent Piano Teacher Injury - Help Wanted! I am super blessed though – my daughter Deanna just finished her Bachelor of Arts in Music Ministry at Kingswood University in Sussex, New Brunswick. She is a 3rd Generation Music Teacher with training in Piano, Voice, Trumpet, Guitar, Theory, History and Harmony, and will teach for me while I recover. She started teaching with me, to meet my students, learn about their learning styles, their goals, and become familiar with their piano, voice and theory programs. As I sat at the back of my studio guiding her through each lesson, I realized that she was setting the stage for becoming the victim of a Teaching Injury! I shared with her 3 Tips to Prevent Piano Teacher Injury. Prevent Piano Teacher Injury - Healthy Tips #1 – Never Reach! Every time you hyper-extend your arm to point to the piano, you are causing wear and tear to your ligaments and muscles. You are putting stress on your shoulders, elbows, back and neck. Instead of reaching, use a laser pointer, a chopstick or my favorite a Pocket Telescoping Magnetic Pickup Tool. This is a carpenter tool that looks like a pen, and extends to allow carpenters to pick up nails without extending their arms. Prevent Piano Teacher Injury - Healthy Tips #2 – Stand and Stretch! Before teaching and in between students, do some basic stretches to keep your neck, back, shoulders and arms relaxed. As teachers, we spend a lot of time sitting. Get in the habit of standing and stretching every half hour (minimum!). Stretching also involves breathing, and our brains work better when we bring in deep breathes of oxygen. Prevent Piano Teacher Injury - Healthy Tips #3 - Drink! No, I don’t mean “drink” drink. I mean stay hydrated! Always have a bottle of water on your teaching desk. Water is the best way to stay hydrated and most of us do not drink enough water. Our brain is 85% water and will begin to shrink when it becomes dehydrated. Drinking water actually helps you think, focus and concentrate better. So, how does it prevent a Teaching Injury? Simple – the more alert and energized you are (which is a side effect of staying hydrated), the less chance you will have of injuring yourself by falling asleep at your desk and banging your head. Drinking water also prevents headaches. So even if you have students who like to trigger headaches, you can help prevent getting a headache by drinking water. Prevent Piano Teacher Injury - Bonus Tip - Use Your Answer Books! 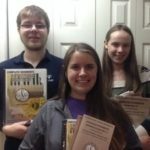 How does using your Ultimate Music Theory Answer Books when marking your student’s Theory Books or Practice Exams help prevent Teaching Injuries? That’s a “no-brainer” (haha). Using your Answer Books saves time. The more time you have to work with your students, the happier they will be. The happier your students are, the less stressed you will be. The less stressed you are, the better you will feel. The better you feel, the less likely you will be of banging your head into a brick wall out of frustration. See! *Grin*. I presented Deanna with her own copies of the Ultimate Music Theory Answer Books, made sure that she had her own refillable water bottle, showed her how to stretch every time she walked through the doorway and reminded her to stop reaching and use her pointer. Hopefully, when she reaches year 35 of Teaching, she will not have the same Teaching Injury that I am dealing with! Deanna has also registered for the Ultimate Music Theory Certification Course and is on her way to learning more teaching tips on how to teach theory, how to build rapport with her students and how to be the best teacher that she can possibly be! 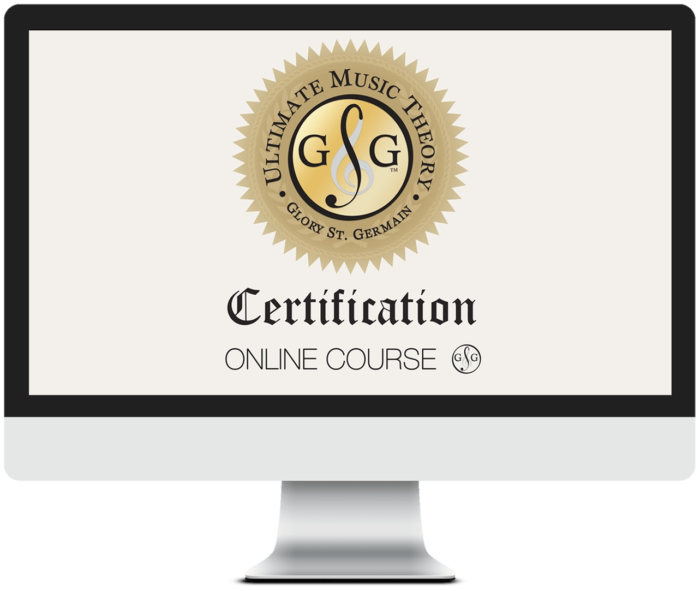 Check out the Ultimate Music Theory Certification Course - Learn More. P.S. – Join the Conversation! Do you have any other tips to prevent Teaching Injuries? Share them with us! Never reach again. Use a laser pointer. The cost is about $2. Thanks Dianne! When I was explaining to Deanna that I needed her to stop reaching, she looked at me and said “But mom, I’m young. I’m limber and flexible.” I looked at her and said….”SO WAS I ONCE and look at me now. So pick up the pointer and use it!” (I am such a mean teacher/mom!) We don’t realize just how hard we are being on our bodies, do we. I never realized that reaching to point to the music for 50 years was causing my shoulder pain. 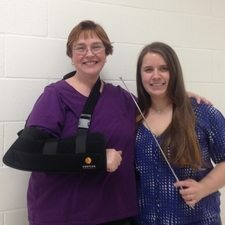 I ended up having shoulder surgery a couple of years ago and it still affects my playing. When I asked the surgeon what would cause the injury he said repetitive motion as in pointing to the music all those years could cause it. We all must reach at times, with pointers not always handy. Train easy release! We and our students can drain the tension instantly. For ‘visual shorthand’, nothing beats a large or small string mop. Settle the strings on a keyboard or table edge (a clean mop for this purpose only! ), with handle horizontal. Mimic arm-lifting with the handle; as it rises, strings will droop, perhaps better if soaked first in fabric softener. That looseness shows the feeling we need. Also, isolate extending and flexing muscles when you reach and retract – one or the other, not both at once! A half-second-slower movement will help also. Point loosely with finger or pointer. Where would one buy a laser pointer? I hope you have a good recovery. Thanks for your tips and reminders. When one is ready for it, I found that water therapy is miraculous in promoting healing and mobility during the recovery process and for maintenance thereafter. Good luck!! Arne again. I forgot the shoulder-focus, but it is covered in much of what I said above – extensors *or* flexors, slightly slower movement – also we control the extension, and must train the mental habit of not over-extending. ALSO, when possible you can reach with the other arm! Divide the effort. This is Year 44 of teaching for me; my main teachers dealt trained natural movement in playing, and it naturally applies here as well. I ordered a laser pointer. My students love seeing me use it! Thanks for the reminder. 🙂 I’ve had arm and shoulder/back problems a bit already, and definitely want to tackle it before it gets worse. Now, it’s getting better. I’m praying for you, Shelagh, that your surgery heals quickly and you find MUCH relief as a result. Thanks so much Kristin. Surgery went well and now the long process of healing begins. I have become very good at one handed typing but I truly do miss my students (and being able to use my right hand).